When travelling to Australia last year, one of the countries my partner and I stopped at was Sri Lanka. We gave ourselves a week there, and this could not have been a more perfect place to start our Asian leg of the journey. If I could describe Sri Lanka in one word it would just be a word as simple as, beautiful! When arriving in Colombo, the capital city of Sri Lanka, you can not help yourself but be overwhelmed with the amount of people that are outside the airport. 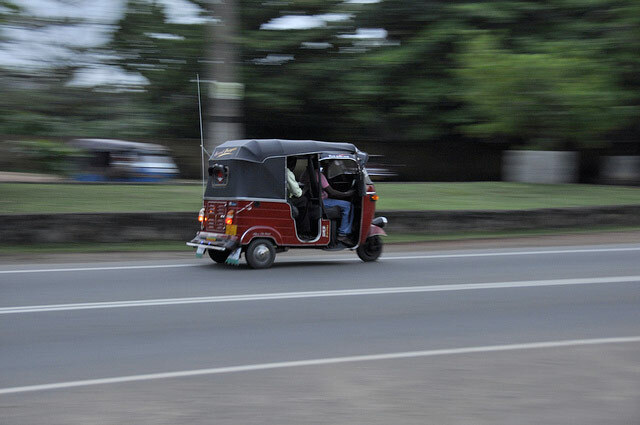 There are taxis, buses, motorbikes, cars and tuk tuks everywhere. We had just got off an 8 hour flight from Rome and were slightly jaded, so this was not a welcoming scenario. However with a bit of chatting to some locals we were pointed in the direction of a bus that would take us to the train station to get to our first destination. After an hour of heavy traffic, bumpy roads and an overcrowded bus we arrived at Colombo Fort Train Station. Here we bought our train ticket in 2nd class and were finally headed to Kandy on a journey that would take approximately 4 hours. I have never ridden a train such as the one that we were on. It was an old diesel engine with carriages on which the doors were always wide open. The experience of leaning out of the carriage and just watching the beautiful rainforests and luscious green open fields roll past is one I will never forget. To add to the natural charm, local children and adults without a care in the world would be strolling along the track, waving and welcoming you to their stunning country. This journey has given me an everlasting memory that I will cherish forever. On arriving in Kandy and now feeling slightly exhausted from the 8 hour overnight flight, the hectic 2 hours in Colombo and the 4 hour train journey, I was ready to pass out. However we had only given ourselves half a day and a night in Kandy before setting off to the next destination so it was time to man up! We got a tuk tuk to our guesthouse which was in the middle of the rainforest. The welcome from the lady who owned the guesthouse was lovely and the sights and sounds of wildlife from our bedroom were enough to get the senses buzzing. However we couldn’t stay and savour this for long as we needed to see what Kandy had to offer. A short tuk tuk ride took us to one of the main streets of the city and instantly you could feel that you were in a place like I had never stepped foot in before. People would stare at you, not in a threatening way, just in a quizzical way as tourism has still managed to stay relatively quiet in this area of Sri Lanka. The locals wanted to know what it is you had come to see and they would always be there to help you even if it is for a small amount of money. 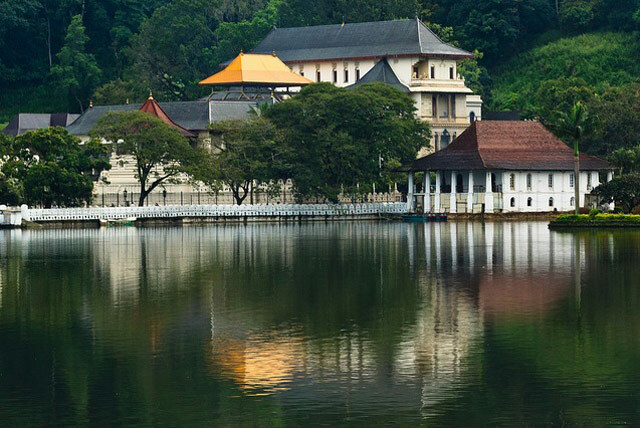 In Kandy it is the lake in the middle of the city that we were guided to and following this the Temple of the Tooth, a Buddhist temple covered in wild monkeys, with an outlook over the stunning lake. This temple is famous for the belief here is still that whoever holds the relic of the tooth holds the governance of the country. 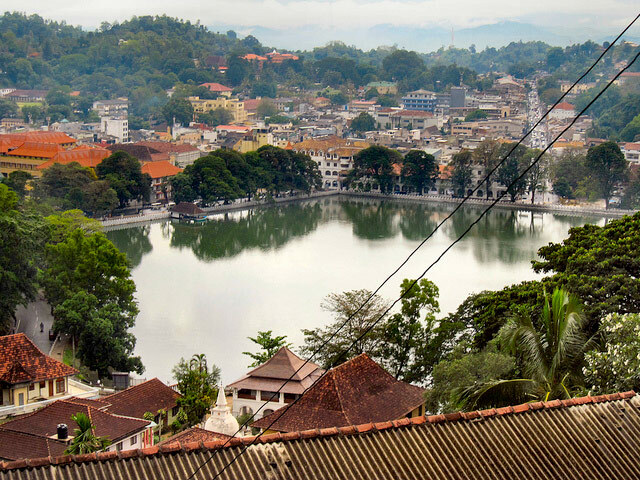 Kandy was the last capital of The Sri Lankan kings and is certainly worth a visit to see this small piece of history that is this temple. After visiting this site it was already getting dark and the heavens had decided to open, and boy did they open! We took refuge in a small bar and experienced our first Lion lager, the Sri Lankan beer. It was here we decided to grab the first tuk tuk that we could and get back to our guesthouse and eat our first Sri Lankan curry cooked by the owner of the guest house. This was a wonderful experience to taste a home made curry in the guesthouse and a lovely way to end our time in Kandy. We could have gone on to see so much more in Kandy; the botanical gardens there are meant to be stunning, and not too far away is an elephant orphanage that is meant to be simply amazing. Sadly time was not on our side and neither was my ability to stay awake after such a hectic fully packed day. It was time for bed and what was going to be an amazing next few days in the hill country of Sri Lanka.